Heat pump systems feature auto mode, which automatically switches between cooling and heating in response to the changing load in the space. Our ductless systems are nearly silent; their fans deliver air quietly and continuously with only a gentle whoosh for constant circulation and filtration. For this reason, Mitsubishi Electric split-zoning ductless air systems have long been the choice in thousands of homes, churches, schools , and libraries across the U.S. and the world. If you are looking for discrete zoned comfort, then a short-run ducted unit is the right solution. As a stand-alone system or connected to a MXZ multiroom system, the SEZ ducted units provide energy efficiency, quiet operation, and a compact design for quick, easy installation either hidden in the ceiling or beneath the floor. 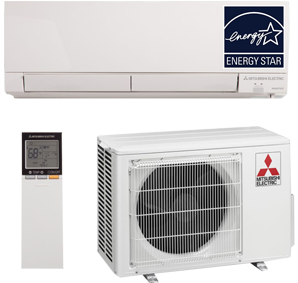 Three of the 1:1 systems are ENERGY STAR certified , and two systems qualify for the federal tax credit. These systems provide customers with an environmentally friendly option that also gives them an installed look that is similar to what they are used to within their interior space.These models offer the added flexibility of working tandem with ductless models on the same MXZ multi-zone system, providing a wide array of installations options to best fit any application. New to our lineup is a Low Wall or Floor-Standing model that can fit into those once difficult installations. These unites provide comfort in spaces such as finished attics with knee walls, basements with low ceilings, and glass-walled sunrooms. 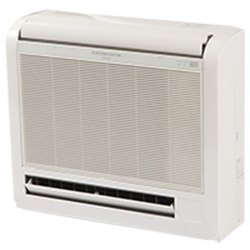 Mounted three inches above floor level, these models provide conditioned air from both upper and lower vents while providing direct front panel access to the filer for easy cleaning. The MFZ can even be recessed in a wall during installation provided proper clearances are maintained. Enjoy ideal levels of comfort in the rooms you use most with our multi-room system. Each room (zone) operates independently. People in different rooms – the kitchen, master bedroom, or living room – can enjoy temperature settings that make each of them most comfortable. If you’re looking for a complete comfort solution for several different rooms, the MXZ multi-room system is the right choice. 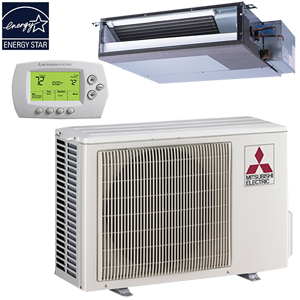 The system is flexible enough to conform to a particular cooling and heating need and offers numerous different indoor unit combinations. In addition up to eight indoor units can be connected to one outdoor unit. Now with a SEZ horizontal ducted unit and a MFZ floor-standing unit homeowners can enjoy an even greater range of zoning options provided by an MXZ system. An MXZ multi-room system is an excellent choice for supplementing capacity to a current system, conditioning newly furnished spaces, or new additions and replacing a system within a home. 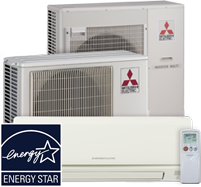 Homeowners can also benefit from lower energy costs year-round while staying comfortable thanks to Mitsubishi Electric’s energy-efficient technologies that are a part of every system that we make.